Dali’s famous lobster telephone immediately springs to mind, but Colbert’s double strikes a more subtly comic tone in appearance and demeanour; it’s more like a cartoon lobster than a real one. And this hits at the centre of Colbert’s artistic project – it is recognizable, even familiar, but at the same time strange and anachronistic. The artistic roots of his works are visible, but twisted up into unfamiliar shapes. Unit London is presenting ‘Hunt Paintings’ at Saatchi Gallery until the 13th of January, featuring 25 of Colbert’s works, including the eponymous paintings, a series of sculptures, and a virtual reality experience to allow visitors the chance the immerse themselves in Colbert’s World of Art. A monumental lobster figurine will also be there, alongside a lobster army. The Hunt Paintings themselves are an extraordinary blend of hyper-saturation, modern consumption, contemporary themes, and the epic narratives and heroic configurations of the Old Masters. American Vogue described Colbert as the ‘godson of Andy Warhol’ and the moniker seems very fitting in light of his work’s strong Pop Art influence, but running through it at the same time is a very powerful sense of art’s historical roots. The contrast is stark – the artistic narratives of Van Dyck or Reubens sharing a canvas with emojis, Instagram likes and Internet Explorer error messages. 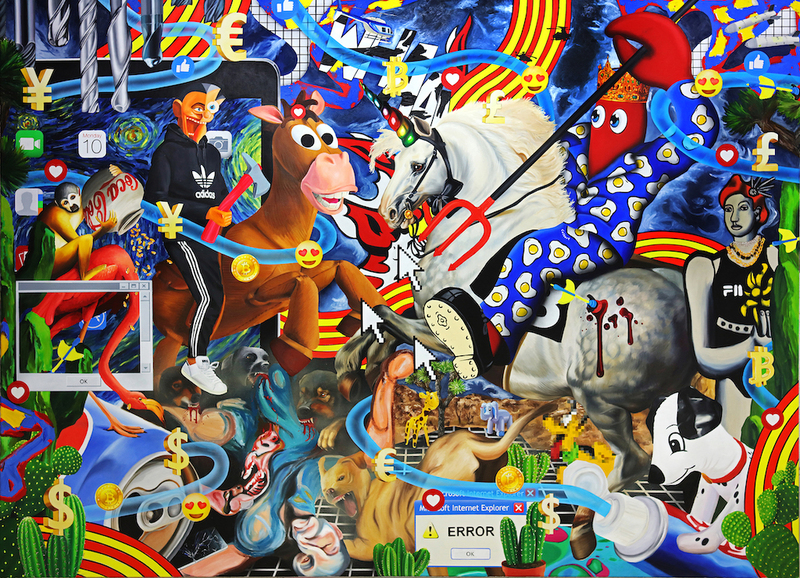 The initial overload of sensory information gives way to the strong composition of the paintings – in Hunt with Dogs, the lobster with the devil’s pitchfork in hand only gradually appears, mounted on a steed, which is a unicorn, opposite an axe-wielding man in an Adidas tracksuit, on a donkey. Then you notice the dogs snarling at their feet (only obvious once they are noticed). And then the painting really opens up. It leaves you with a very particular kind of feeling. The viewer gets a strong sense of that old historical painting. The king is hunting on his prize horse, weapon raised to the sky – a familiar narrative, but with unfamiliar players. Impossible to put into words exactly, but that seems like one of Colbert’s aims with the exhibition: to create something which cannot be put into words exactly. The meaning is muddled up. The paintings toy with the viewer. The superimposition of banal and commonplace objects into the frame is as deliberate as everything else in Colbert’s work. It plays with our cultural vocabulary, merging portrait and popular culture, the epic and the prosaic, in unexpected ways. As viewers we begin to adjust to the strange world of the painting, only to realize that we only almost recognize it. With the exhibition, Colbert wants to ‘reflect the hyper saturation of culture and our crazy, ferocious appetite for image consumption.’ And in the process of trying to work out exactly what each painting is saying – Dark Hunt Triptych is so different from Milk Splash, but how? – we, the viewers, begin to fall prey to our appetites. We want to consume the images, to work out what they mean and be done with them, but they resist all such attempts. What do the emojis mean? And, really, why a lobster? These and a thousand other questions appear as soon as we begin to really look at the paintings. And the only way to answer them is to look for yourself. Colbert’s paintings are epics told through the debris of human culture, tracing roots through art as it was and art as it is. If you love that sense of bewildered amazement only the most enigmatic art provokes, there’s still time to see the exhibition. 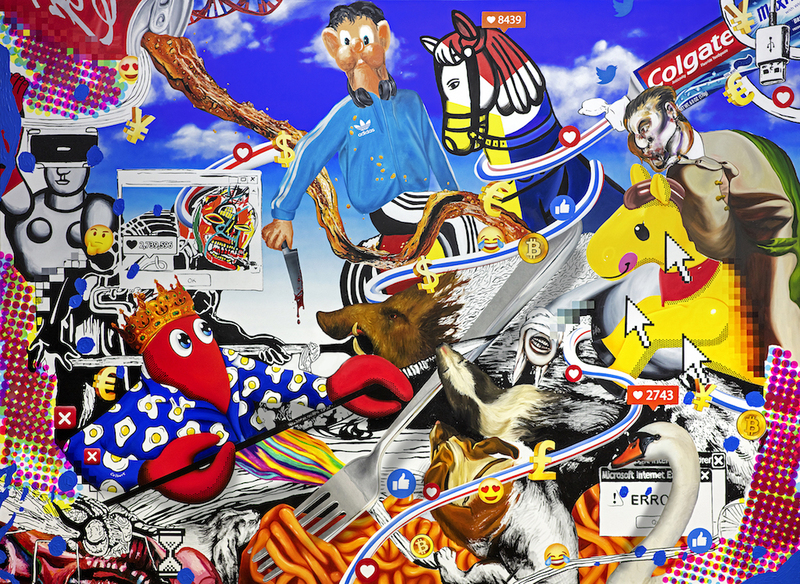 Philip Colbert’s ‘Hunt Paintings’ is on display at Saatchi Gallery until the 13th of January.